Material and Finish: Polished stainless steel posts and stainless steel top rail. 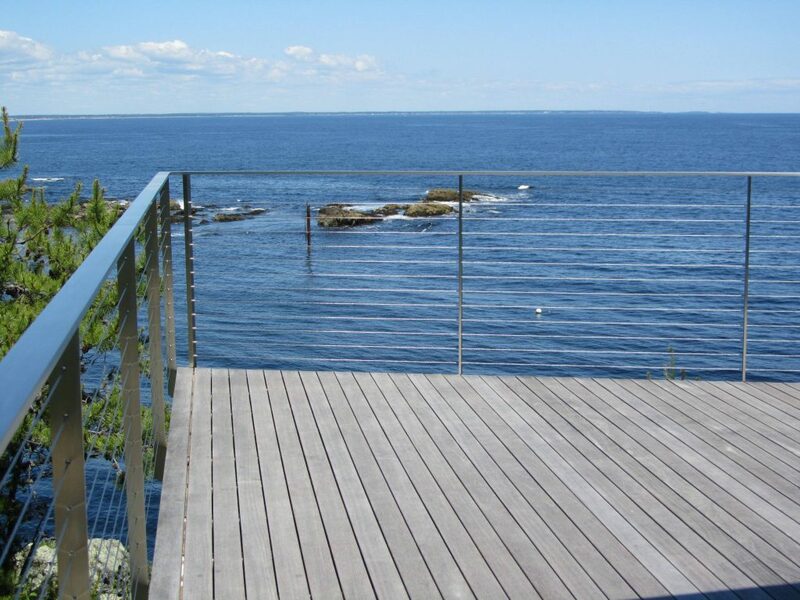 Description: Ithaca Style stainless steel cable railing. For this project in Ogunquit, Maine, our client was a retired fashion designer with a taste for minimalist design. 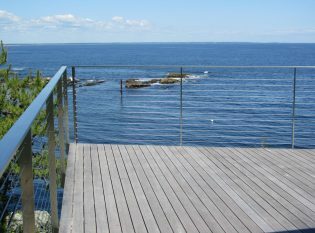 Her home directly overlooks a small harbor on the Atlantic Ocean and she wanted a modern railing system with clean lines and a simple design that would not distract the eye from the deck’s stunning natural view. The client chose our Ithaca Style cable railing which has the thinnest posts of all our designs. We fabricated the posts from solid type 316 Marine grade stainless steel because of the material’s durability and resistance to corrosion which is a major concern in saltwater environments. The stainless steel cables that serve as the railing infill blend in perfectly with the deep color of the ocean water and naturally fade out of focus when you look through the railing out to the harbor. We welded and polished the steel top rail to create a seamless look across the railing design. To maintain a minimalist style and to match the modern exterior of the home, the homeowner didn’t want any splices in the deck boards and wanted to minimize exposed hardware. She had the IPE decking installed with hidden deck fasteners. As a result, the entire deck has a clean and simple look that is perfect for relaxing outdoors.